You can imagine the excitement in our studio each time we create a new collection. The creative process brings the whole team together for days, discussing unique flower varieties, greeneries and color combinations. This spring, we decided to focus on the vases we offer; pouring over styles and designs that would work with the spriggy florals and sweetly scented bulb flowers that are only available in the spring. So about that vase. We believe that you should get a beautiful vase when you order flowers. This spring, we've introduced three new styles for our cut flower arrangements, a new style for our living arrangements and a gorgeous terra cotta pot with silver accents in our plant collection. The April vase feels very French to us. It's a glass, pedestal vase with a fluted opening. We think this will be a versatile vase for your personal collection that will work all year long. The Silver Crackled Bowl is a little more glamorous and adds sparkle. We used pink and white flowers in two designs and then went for some really hot colors in the third. If you are entertaining this spring, you might consider ordering arrangements in this vase. It comes in two sizes which means we can put together a beautiful tablescape for a long table or provide accent pieces for your buffet and mantle. Please call and speak to one of our designers about your ideas. Are you following in love with copper? We are, too. I came up with the "Lizzy" design shown here for our dozen roses at Valentines Day. A very nice guy came in late in the day asking for roses in a vase with a little bit of pizazz. 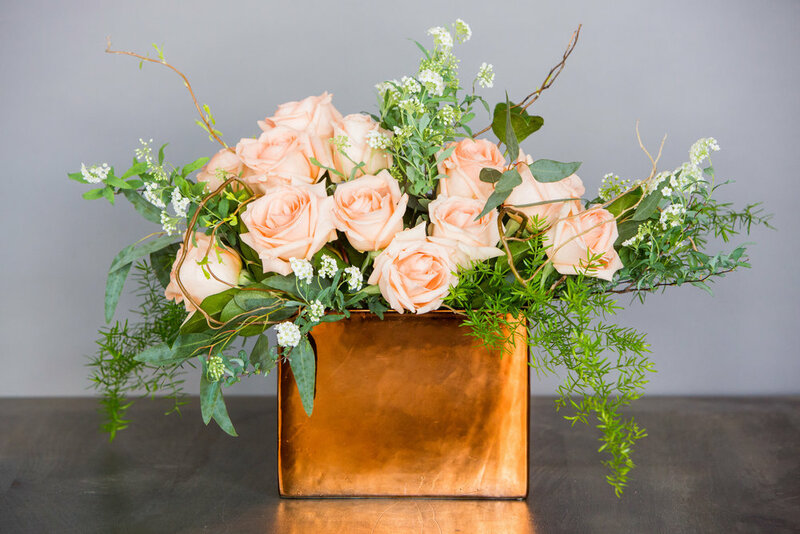 I arranged red roses in the copper vase and we all fell in love with the cool shape that we can create in it. We went with peach for spring in our photos, but you could use white, pink or even purple; creating beautiful contrast. "Jane," Orange, yellow and pink Tulips grouped in color in a glass rectangular vase, with river rock and twine. We like to photograph our arrangements outside. No matter how talented the photographer (and Lisa Robinson is a true talent), flowers just look better in natural light. This season we headed to Rust Manor House right here in Leesburg, Virginia with five of our favorite designs. We always look for natural backgrounds with textures and contrast. Here's "Jane" our tulip garden on the wall next to the Manor House. Lilac, Hyacinth and Tulips are flowers synonymous with spring. These stems are natural room fresheners and they're both soft and stunning. The Spirea comes in to the studio and explodes into tiny, perfect white flowers. Snapdragon and Stock in lovely shades of pastel nestle perfectly among the Pittosporum and soft ferns. We look forward to delivering an arrangement to your home so give a little nudge when you have a chance -- we'll be expecting the call. Would you like to learn more about flowers? Subscribe to our weekly blog by completing the form below.